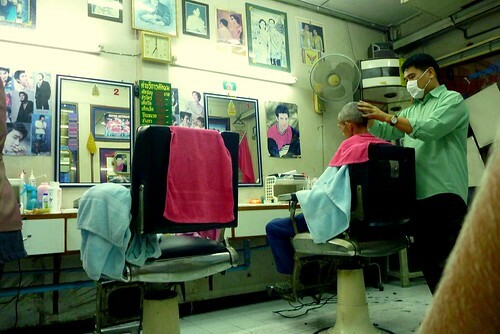 There are many barber shops in Bangkok – and one reason for that is that Thai people generally tend to place a very high importance on a proper appearance. You probably already know that Thailand is a Buddhist country, where more than 90% of the population are practicing Buddhists. But Thailand also has been influences by Brahmanism. In Brahmanism, it is believes that people should not cut their hair on Wednesdays – and that’s why some barber shops are closed on Wednesdays. At many stores you can also get a wonderful, half-hour head massage. Just tell them whether you want to have some beauty products used on your hair or just a the head massage without anything. The Brahmanistic influences have come into Thailand more via the ancient Khmer kingdom (what is now Cambodia) rather than directly from India, and that’s why it’s not a Hinduistic Brahmanism. One of the main reasons probably was a royal tradition – as in Brahmanism, it is common to declare that kings are in fact half-gods, which gives them more authority to rule.